KKCS conducted an extensive structural inspection to assess the existing condition of the reinforced concrete San Francisco Ferry Plaza deck to support vehicle loads. 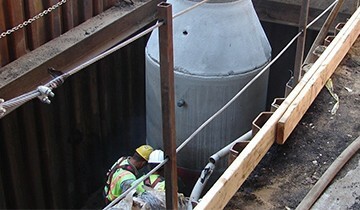 Non-destructive testing methods, including visual observation, sounding tests, and Ground Penetrating Radar were used to obtain information on the condition of the under-deck. KKCS developed innovative designs to restore the strength of the deck while also providing vehicle access for Ferry Plaza tenants. To meet the unique project constraints, two steel bridges were designed to allow vehicle access to the ferry deck while protecting the public at the same time. Steel was chosen over concrete for the bridge design to limit the superimposed gravity loads onto the existing concrete piles that supported the deck. This project was delivered on time, within budget, and to the satisfaction of all parties involved. 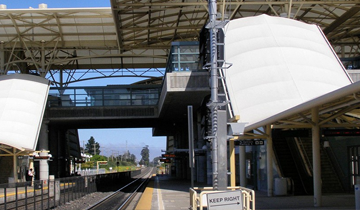 KKCS’ flexible and responsive coordination has repeatedly yielded cost savings, time savings, and high-quality deliverables for BART.